يشكل فندق فندق سوفيتيل ملبورن أون كولينز بموقعه الممتاز في قلب Melbourne CBD نقطة انطلاق ممتازة لاستكشاف ملبورن. يسهل الوصول إلى هذا الفندق ذو 5 نجوم من المطار، فهو يبعد عنه مسافة 19 km فقط. إن سهولة الوصول من الفندق إلى المعالم السياحية الشهيرة الكثيرة في المدينة كمثل Dendy Kino Cinema, Collins Place, Haigh's Chocolates Collins Street هو استثنائي بحد ذاته. كما يقدم فندق سوفيتيل ملبورن أون كولينز الكثير من الخدمات لإغناء رحلتك في ملبورن. يقدم الفندق فرصة للاستمتاع بشريحة واسعة من الخدمات بما فيها: خدمة الغرف على مدار الساعة, أمن على مدار 24 ساعة, محطة شحن السيارات الكهربائية, خدمة التنظيف يوميًا, متجر هدايا/تذكارات . ادخل إلى واحدة من الغرف 363 وتخلص من عناء نهار طويل بمساعدة مجموعة كبيرة من الخدمات كمثل تلفزيون بشاشة مسطحة, سجاد, كرسي عالي للأطفال, قهوة فورية مجانية, شاي مجاني الموجودة في بعض الغرف. يمكنك طلب اللائحة الكاملة للخدمات في الفندق ومن بينها مركز للياقة البدنية, مسار جولف - ضمن 3 كم, تدليك. يحظى فندق فندق سوفيتيل ملبورن أون كولينز بموقع ممتاز وخدمات يصعب منافستها. Generally enjoyed my stay at the Sofitel. Room was nice and bed was comfortable. Was a little surprised for an international brand that they do not have universal electric outlets or readily available adapters in the room. Also, wifi was not free... which is very unusual in most hotels now. Our stay was pleasant the staff were hospitable the hotel has great room views and a buffet breakfast to die for. What i was disappointed with was the $55.00 AUD Valet parking charge i incurred with no warning or no choice in the matter as hotel parking is limited . i believe if you pay for a room like i did which cost me close to $300 for the night and then get slapped with a $55 dollar Valet parking fee to park my car for 8 hrs is highway robbery,i will not stay at this hotel again unless parking is included. Sofitel on Collins is a hotel located at the far end side of Collins St near the government houses. It is near good restaurants and coffee shops as well as luxury item stores like Cartier. There is a train stop just few steps out of the building, and the shopping district is just a mere two blocks away. 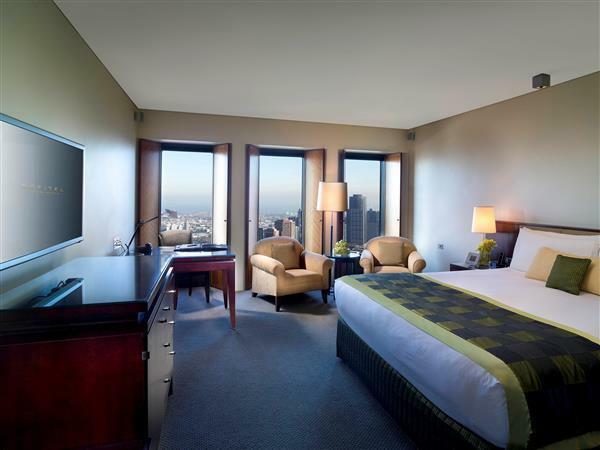 This makes Sofitel on Collins a very convenient place to stay into if you are the type who wants to get a rest after a long day of shopping, before going for a dinner or a night cap. Another good thing about the hotel is the generously sized-rooms as well as the luxurious linens and sheets. They have, for me, one of the more relaxing hotel rooms I have ever stayed in. On my short trip however, I was just able to have one breakfast in bed, and was not able to try their in-house buffet or lunch/dinner room service. This is not because they are not good, but there were just a lot of restaurants to choose from nearby. My wife and I stayed here because we are celebrating our one year wedding anniversary. It is not customary for hotels, but we were kinda hoping they would upgrade us or brought us some wines and cheeses inside the room. The staff who checked us in, did not seem to care about it. The hotel is conveniently located near many great restaurants and cafes. 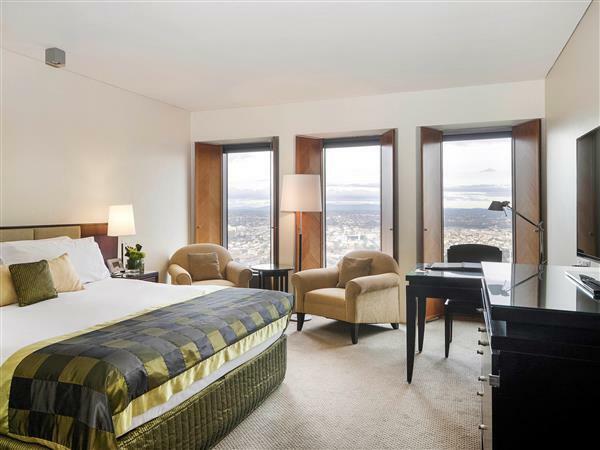 The room itself was in excellent condition and had an amazing view across Melbourne. The staff were friendly and helpful. My only complaint would be that my room service meal was quite small for the price. Spacious room and great room. 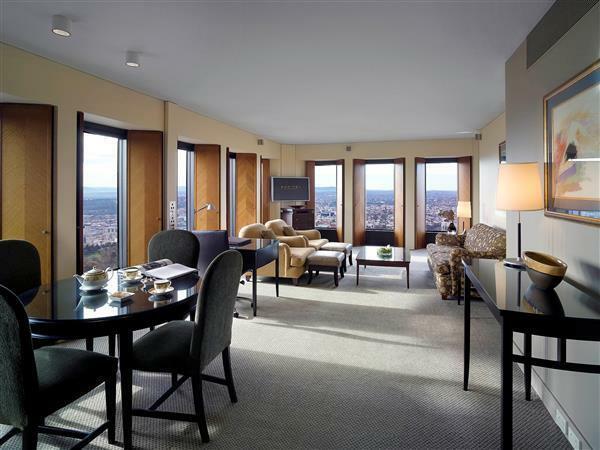 Spacious, clean and tidy room with great view. But the staff were not passionate and cheerful. By paying an expensive rate to stay in the hotel, it was expected that the wifi was fast but it came out to be a great disappointment. The hotel only shared the wifi of the connected mall which was unacceptable. Magnificent overnight stay with stay that were friendly and helpful throughout. The hotel did their obvious best in looking to accomodate our every request - even to the point of sending a bottle of sparkling wine when they realised it was our wedding anniversary. Great Location walking distances to many Places of Interests and also to the City Tram too. Beautiful City View of Melbourne City Skyline Day and Night! Love this hotel although it is starting to look a little tired. The beds are amazing! Stayed in a Club Sofitel room, definitely recommend it - the rooms are on Levels 47-49 so the view is spectacular, I spent some time just gazing out the windows enjoying the view and the club access is great for Breakfasts, Light Lunches, afternoon drinks and a late evening snacks. Atrium Bar was quiet - since we stayed early in the week, which was good, and another review stated that the lifts can get a little busy when the hotel is fully booked - they werent wrong... 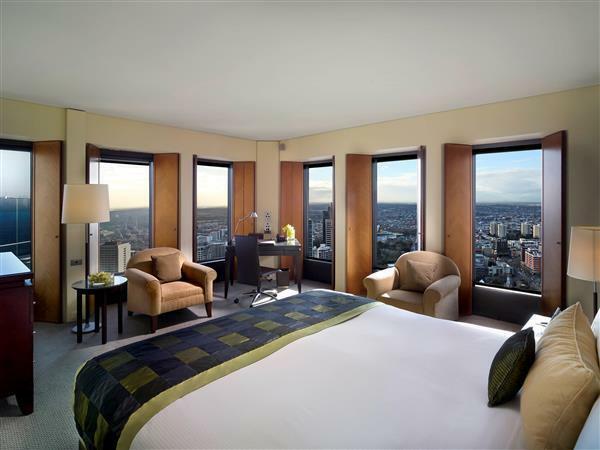 Overall though, loved the hotel and would shortlist Sofitel Melbourne when staying in Melbourne next time. 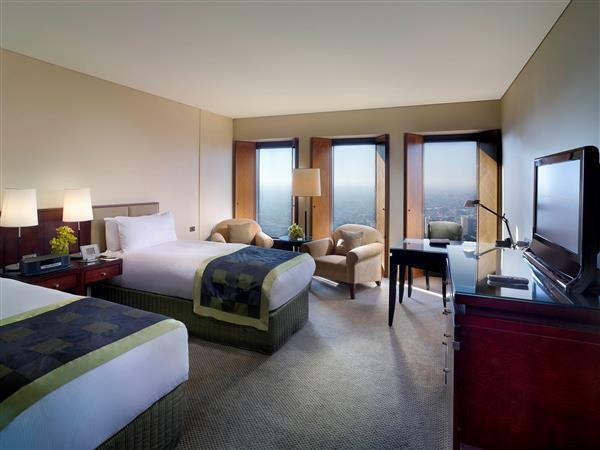 We decided to treat ourselves for a weekend and stay at the Sofitel. Not usually in our price range, but for a special treat, it was fantastic. We had the valet take care of our car, checkin was a breeze and we stayed up on the 40th floor with views that went for miles. The room was lovely, the bed so so comfortable. It was a lovely stay and I'd love to stay again, but probably not in the budget anytime soon. Breakfast was VERY disappointing. Service was poor. I had to send the scrambled eggs back. They tasted "off"and we're green in part. Tried the made to order omelet and it was bland and disappointing again. Asked foe a second cup of coffee and it never arrived so we left. Great shame as the hotel in itself is excellent. Stayed at Sofitel for one night - had a wonderful room with a splendid view. The bed was excellent and so was the breakfast. Did only have 24 hours in Melbourne. The staff was very helpful also in guiding me on what to see and where to go. 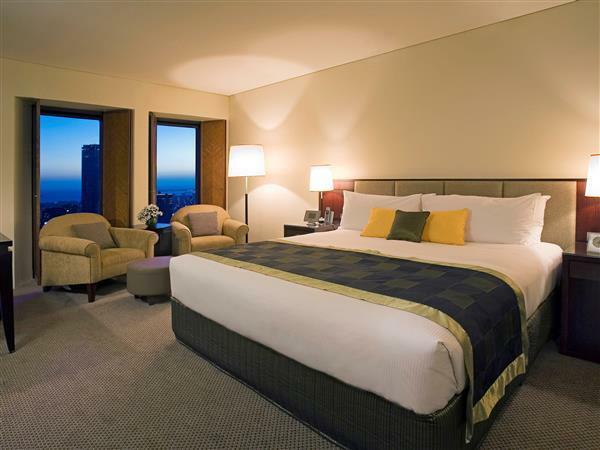 So if I get the opportunity to go back to Melbourne.....I would stay at Sofitel again.